How to paint a beehive for beginner beekeepers. Painting a beehive is simple if you remember this basic principle. Paint the outside and leave the inside where the bees live unpainted. While it is not necessary to paint your hive and some people choose not to do it at all, painting a hive will help it stand up to the elements and last longer. Paint helps protect wooden hive parts from the rain, snow, sun and other weather elements. Before painting you hive, you will need to coat the hive in an exterior primer first before putting on the final coat of paint. I recommend an oil based exterior primer for better weather protection, but any type of exterior house primer will work. For the pictures here I used a gray oil based primer left over from another project. The color of the primer is not important. But primer is important to seal and protect the wood, it helps the final coat of paint adhere better, and helps the surface paint resist moisture and mildew. I used a gray colored primer left over from another project to paint the hive boxes. When choosing a topcoat color, white is the classic color to pick for a hive, but almost any color will work. It is best to avoid black or another very dark color because these colors may cause the hive to get too hot in the summer sun, depending on the location (although some beekeepers in colder climates paint their hives dark for this very reason!). Any leftover exterior house paint you have lying around will work. If you’re not picky about the color, you can save a few dollars by getting quarts or gallons of discounted “oops” paint on clearance at the hardware store. As long as the color is not too dark and the paint is exterior house paint you can use it to paint your hive. One thing to consider when choosing the color to paint a hive is whether or not you want the hive to blend into its surroundings or stand out and be noticed. If you have neighbors close by who may not be happy living near a beekeeper, or your hive is in a place where it can be vandalized, it is probably best to paint the hive in muted colors or a color to blend into the apiary. This slight camouflage will help the hive remain unnoticed to most passerby’s. If this is not important to you then go ahead and have fun with it, get creative with colors and patterns, the bees won’t mind and it will make for an interesting conversation piece. This is also a fun project to do with children, who can come up with some amazing designs! Painting a bee hive is simple if you remember this basic principle. Paint the outside and leave the inside where the bees live unpainted (the only exception is the bottom board). A complete breakdown and list of which hive parts to paint is included below. For a description of the parts of a beehive please read Parts of a Beehive and watch this short video How to Set up a Beehive. Wooden Hive Stand – Paint all surfaces. The hive stand needs to stand up to the elements. If you use pressure treated wood for your hive stands, you will not need to paint them. That being said, I have never painted my untreated wooden hive stands and they are just fine. Bottom Board – Paint all wood surfaces. DO NOT paint the screen if using a screened bottom board. The bottom board gets the most abuse so it needs to be well protected. Hive parts painted with primer. Left to right – outer cover, screened bottom board and slatted rack. Entrance Reducer – DO NOT paint this piece. It is only used sparingly and may be chewed on by your bees if used for longer periods. Slatted Rack – Paint the outside plus the top and bottom edges. DO NOT paint the inside. Some people choose not to paint the top and bottom edges because they find it causes the hive bodies to stick together in warm weather. I have not had this problem where I live in New England as long as my paint has had time to dry thoroughly before using the hive. Hive Boxes or Supers – Paint the outside plus the top and bottom edges. DO NOT paint the inside. Again, some people choose not to paint the top and bottom edges because they find it causes the hive bodies to stick together in warm weather. I have not had this problem where I live in New England as long as my paint has had time to dry thoroughly before using the hive. Frames – DO NOT paint the frames. Inner Cover – DO NOT paint the inner cover. Outer Cover – Paint all wood surfaces on the outside. Paint the top and bottom edges and inner sides. DO NOT paint the inside/underside. DO NOT paint the metal top. The parts of one hive painted with gray primer and left to dry in the sun. As seen left to right – two hive boxes, slatted rack, screened bottom board and outer cover. This photo illustrates what parts of the hive to paint and what parts to leave unpainted. After this primer dries the hive will be painted yellow to match our house. 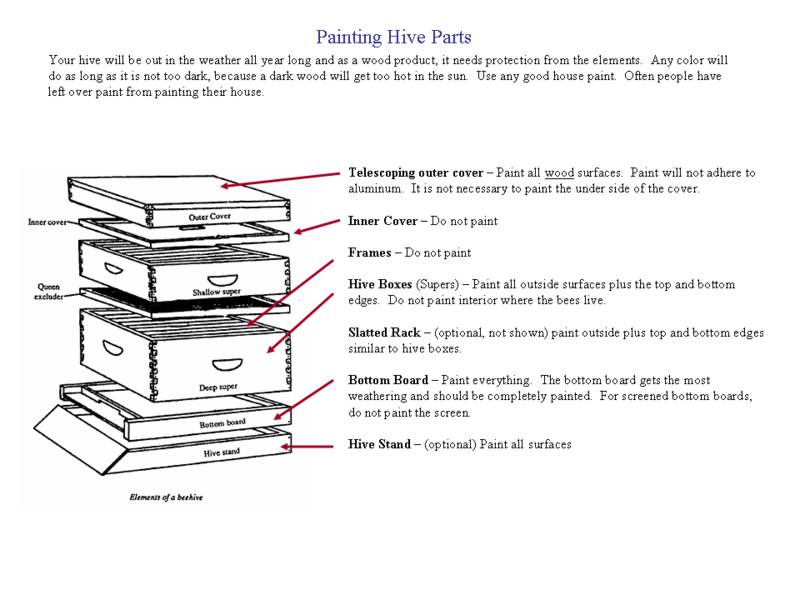 Here is a link to a helpful graphic from Essex County Beekeepers Association indicating what parts of a hive to paint. Sign Up Now for our email newsletter to get beekeeping tips! Thanks so much for commenting on our new bees. Your site is wonderful and we’ll be checking it regularly. We’re expecting the rest of our hive boxes soon – thanks for the info on painting them. We chose to get the unassembled ones because of the price difference. We’re so very excited. You’re welcome and thanks for stopping by. Assembling hive boxes is simple. You will be glad you saved the money when you’re done. If you have any questions please read How to Assemble A Bee Hive Box or Super. Good luck with your bees! What if you accidentally use pressure treated wood to build a top bar hive. Can you paint the inside of the hive and still use it or do I need to start over?